SAN FRANCISCO (Reuters) - Apple's large-screen iPhones are a big hit in China, taking market share from Samsung and selling at a pace that may make China a greater source of revenue than the Americas for Apple in coming years, analysts said. The world's most valuable consumer electronics company reported on Monday a 71 percent increase in sales in China to $16.8 billion, driven by its new, bigger iPhone 6 and 6 Plus. In the first three months of the year, for the first time, Apple sold more iPhones in China than in the United States. Consumer demand for the newest electronics pushed sales in China to 29 percent of total global sales for Apple in the first quarter, compared with 21 percent a year ago. By comparison, the Americas represent 37 percent of total sales, but are growing more slowly at only 19 percent last quarter. "The bigger screens on iPhone 6 have been selling like hot cakes," said Daniel Ives, an analyst at FBR Capital Markets in New York, who estimated that China could represent as much as 40 percent of Apple's revenue by 2017. For Apple, China is "the golden goose," he said. The surge in sales, helped by Chinese New Year gift-buying, was caused by a latent build-up in demand, analysts said. "Apple fans in China had been waiting years for bigger-screen iPhones and they are upgrading at a furious rate to the new models," said Neil Mawston, executive director at research firm Strategy Analytics. Samsung won over millions of Chinese mobile customers four years ago with its Galaxy Note 'phablet', creating a whole new category somewhere between a phone and a tablet, with screen sizes of more than five inches diagonally, compared to the previous standard of about four inches. Apple is starting to win some of them back again. "Apple really had no choice but to come back with a bigger screen iPhone for the 5-inch category to bring those switchers back, and that's precisely what they've done," said Mawston. Chinese customers gravitated naturally to the bigger screen size, as it makes it easier to input Chinese characters with a finger or stylus on the screen and is more effective for video. For many Chinese, the phone is also the first, the most important, or even the only computing device they own. "People just use them for more, and therefore appreciate the bigger screen," said Frank Gillett, an analyst at technology research firm Forrester. Chinese customers tend to do their computing on-the-go or at various locations, partly due to patchy broadband availability at home, and is truly a 'mobile-first' tech culture, said Gillett, which puts extra value on the phone. Apple's distribution and marketing in China has now also clicked into place, analysts said. In October, for the first time, Apple offered phones with all three major carriers, China Mobile, China Telecom and China Unicom, with attractive subsidies. That presence may bode well as Apple looks to win new customers and entice others away from Samsung and local competitor Huawei. "People don't drop their brand new phones and run out and get new ones immediately," said Gillett. "It takes a while to build up steam as people hit the replacement cycle." Apple is also making inroads outside of the biggest cities. Its phones are now sold in more than 40,000 places in China, Chief Executive Tim Cook said in a call with analysts on Monday. 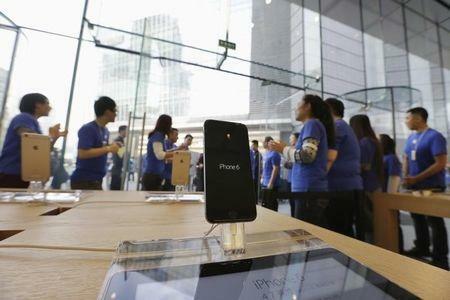 Analysts say Apple makes higher profit margins on the iPhone 6 Plus. Apple doesn’t say what its sales or its margins are for individual phone models. The bigger phone, with a 5.5 inch diagonal screen compared to 4.7 inches for the regular iPhone 6, sells better in China than in any other region, said Mawston, although it still lags sales of the smaller, cheaper iPhone 6. "The 6 Plus has its lowest volumes in Latin America, Africa and the Middle East, and its highest in East Asia, while everything else is in between," he said. As far as many Chinese are concerned, the bigger the phone the better. "Some consumers aspire to own the 'full set' of a big house, big car, big TV and big smart phone," said Mawston at Strategy Analytics.